Distinguishing Characteristics: Hispanic female. Black hair, black eyes. Alexandra's ears are pierced. Distinguishing Characteristics: Hispanic male. Black hair, black eyes. Angel has a scar on his left side. 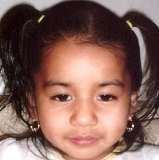 Alexandra and her brother, Angel Gallegos-Guzman, disappeared from Omaha, Nebraska on February 9, 2009. Authorities believe they were abducted by their non-custodial mother. Photographs and information for the mother are unavailable. They may be traveling in a gold SUV. They may still be in Nebraska, or may have gone to Florida or Mexico. The children's whereabouts are unknown and their cases remain unsolved.